When you are deciding just how much of your home you would like to remodel, and, at the same time, determine what the budget will be, we understand that this will entail quite a lot of research on your part. At Valcon General, we understand that, in most cases, your biggest asset and pride and joy is your home, and in every remodeling project we take on, we treat it as if we were remodeling our own AZ home. The first step that Valcon General takes is to allow as much time as necessary to work with our clients so that what they envision their dream kitchen remodeling project will look like is what they actually will have when the project is complete. The next step is to sit down with our clients to fully understand what exactly they want to remodel and what their budget is for the project. As you can see, Valcon General takes the time to go through every aspect of your remodeling project, making sure the end result is what you envisioned the project to be. At Valcon General, we insist on only using superior materials, because we understand that adhering to this principle not only makes good business sense, but if it was our home we were remodeling, that’s how we would want it done! In addition, we have a select group of sub-contractors that we have worked with for years. They are fully licensed, insured, and above all, have a stellar record and reputation for incredible quality and workmanship. A complete Phoenix home remodel entails many things including permits, finding the right quality products, professional and experienced sub-contractors, and the ability to make all these things flow together so the process goes smoothly. That’s why it is so important to have the right General Contractor coordinating all these different factions to ensure your remodeling project is done right. With over twenty years experience in the construction industry, the one General Contractor that you will want for your remodeling project is Valcon General. 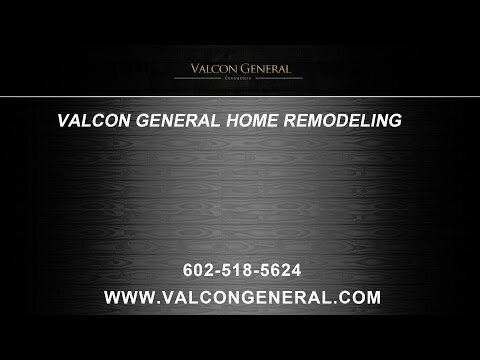 If an Arizona home remodeling project is in your immediate or near future, please call the experienced and professional contractors at Valcon General for a consultation. We look forward to working with you on your remodeling project.